Campaigners gather outside the former Brighouse Swimming Baths site. 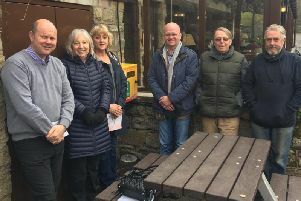 Concerned campaigners gathered at an “eyesore” site in Brighouse to urge Calderdale Council to take action and improve its appearance. The former Brighouse Swimming Pool, on Mill Royd Street, has been in disrepair since 2006 when it was closed after being deemed structurally unsafe. There was hope of regeneration in 2011 when the site was put up for sale by the council but the building, which was once a display of great civic pride, has remained derelict since its closure. The council said it is taking steps to tidy up the site, but has not issued a Section 215 Notice which requires land to be cleaned up when its condition has an adverse affect on the amenity of an area. Now, campaigners have vowed to fight for the land to be given a much-needed facelift. Siobhan Smith, 43, of Huddersfield Road, said: “It really is an eyesore and we would like something doing with it because it needs tidying up. “Nobody seems to be doing anything about it and people are sick of it. “I drove past the other week and I just thought ‘I’m sick of it’. I asked if other people felt the same way and there has been a big response. “We have a lovely town and it’s becoming an eyesore. If people don’t stand up and say ‘we are not happy’ then nobody will take any notice. “It’s a complete and utter mess. There’s rubble, wire, exposed drains and windows have been smashed - people could easily get in. “If they had demolished it and left it as a flattened building, it would have been better than it is at the moment. “We have a lovely park, we have people who are trying to make the town bettter, small businesses are putting money into the town and then we have some areas that are just awful. “I’ve lived in Brighouse all my life and I want my kids to live here and for them to not have eyesores in the town. In response to the concerns, Ian Gray, Calderdale Council’s Director of Economy and Environment, said: “In the light of the concerns that have been expressed about the condition of the site, an inspection has been undertaken by a planning officer. It was noted that work appeared to have commenced on demolition. However, this was not progressing at the time of the site visit. “We are making contact with the owner to discuss measures to tidy the site up in the short term as well as their longer term intentions.